Johnny Winter’s 1965 Firebird V came under the auctioneer’s hammer in autumn 2016. We track down the new owner and details the rise of Gibson’s bold and iconic design. John Dawson Winter III was born in Beaumont, Texas on 23 February 1944. He began playing guitar via the unusual route of turning first to the clarinet and then ukulele, settling on the instrument that was to lead him to worldwide renown around the age of 11. His first experience of performing was with his brother Edgar, initially as an Everly Brothers-inspired duo and then, at the age of 14, in his first band, Johnny And The Jammers. During his formative years, he was exposed to a vast style of music. “I think that’s what I liked about growing up there; you could just hear so much stuff,” he told Guitarist in 1992. This exposure to music helped him during those early years. Fame found Johnny at an early age, as he began his recording career while still at school. “That was the most exciting time. I was about 15. I made my first record and I started playing in nightclubs and I had my first drink. It was a real exciting year; all the stuff was brand-new and you could be driving to the gig and hear your record on the radio. Although Johnny’s life was a rollercoaster of career highs and drug-related lows, he kept touring, declaring that he loved to entertain people on the road despite not being too keen on the travel involved, especially in later years. Johnny passed away on 16 July 2014 in Switzerland, two days after a gig at the Cahors Blues Festival. There’s a video performance from that festival on YouTube with Johnny playing a rousing version of the blues classic Dust My Broom. He is playing seated, as he did in his final years, but the performance has all the fire and vigour we’d come to expect from him. At the time, the official cause of death was never released, but close sources implied that it was due to a combination of emphysema and pneumonia. He is buried in Union Cemetery, Fairfield, Connecticut. In autumn 2016, there was a sale of Johnny’s guitars at Guernsey’s auctioneers in New York. Among the items up for sale that day were a few guitars and many personal effects including stage wear and handwritten notebooks. Lot #148 was the 1965 Gibson Firebird V in the very rare custom colour, Inverness Green. “This guitar is prominently featured in Winter’s worldwide Sony film release, Johnny Winter: Down & Dirty… Serial No. 255115. Vibrato tailpiece (which was standard with Firebird V) has been removed by Johnny, as he preferred the sound of the guitar without them. On the day, the winning bid was made by John Jackson, international booking agent at K2 Agency in London - who represents major rock bands such as Metallica, Iron Maiden and Alter Bridge. We called in at John’s Chelsea office to view the guitar. “I’ve been a fan of Johnny Winter since I can remember,” he told us. “I saw him on his first ever tour at the Royal Albert Hall and The Speakeasy - which I shouldn’t have been allowed to get into because I was well under age - and The Roundhouse and Fairfield Halls, Croydon. The guitar sold for $60,000 (£38,995), which, when you think about it, isn’t completely off the wall for a rare 52-year-old Firebird, let alone one with this kind of provenance. Johnny was generally seen playing his aforementioned ’63 sunburst Firebird, but the ’65 made the occasional appearance, too. “I’m aware that he used it mostly in the 70s,” John says, “but on the DVD Down & Dirty that came out last March, he’s being interviewed; he’s in a rehearsal room and he lifts it out and puts it down. On the day we saw the guitar, we commented on the colour. In some lights, it’s most definitely green, but in others, it takes on more of a blueish sheen, doubtless due to the yellowing of the clear nitro lacquer over the finish. The inlays in question are the eagle and cloud, mentioned in the auction catalogue entry above. And they make the guitar even more of a one-of-a-kind. We wondered what John’s plans for the guitar are now. Is it destined to spend the rest of its days in a glass display case? 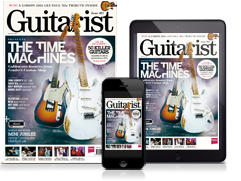 “Ideally, I’d like the guitar to have a life of its own,” he says, revealing that he would like to see the guitar in the hands of some of his clients, live on stage. “If Joe Perry wants to play it, he can go ahead. Kirk [Hammett] will; he’s probably already picked the song that he’ll do! And surprisingly James [Hetfield], when I told them, his ears pricked up. So everybody’s a Johnny Winter fan. Johnny Winter’s Firebird V is obviously set up for slide, although not dramatically so. When we picked it up to play, the action was only slightly higher than was comfortable for regular playing. It had the sonority of an all-mahogany guitar mixed in with the unique timbre for which the model is renowned. Johnny is on record as saying that he liked the sound of the Firebird because it sat in the middle of Gibson’s and Fender’s signature sounds - Strat-like tones with a Gibson feel, if you like. Masterminded by Ray Dietrich in the early 60s with the brief from Gibson to design a guitar with popular appeal, the Firebird followed on from their forays into bold, new - but at the time, unsuccessful - worlds with the Flying V and Explorer. Records show that, in the year in which this guitar was produced, only 353 Firebird Vs left the factory. In fact, in its initial production run between 1963 and ’69, there were 1,417 Firebird Vs made. Not a massive number of guitars by anyone’s standards. “The standout thing with those guitars is the pickups, because they are unique and, quite often, they get confused with other mini-humbuckers. They have different bobbins and I think they might have used a different Alnico as well, but their construction is different. Certainly, the resemblance to the Stratocaster is evident, but, strangely, it’s this area of the guitar that is responsible for what many repairers know as ‘Firebird Disease’, where the weight of the banjo tuners leads to impact damage. We noted that on Johnny’s guitar there was a crack at this point, although it was difficult to see if it was just a finish check or whether it went into the wood itself. It’s not unknown for Firebird headstocks to become detached.